In 2016 I spent some time working on a VLF/LF receiver by I2PHD that was fully software defined, see here. The challenge of this approach is the speed of the ADC and subsequent processing that is required within a microcontroller. There just were not enough clock cycles to implement a waterfall display for example. 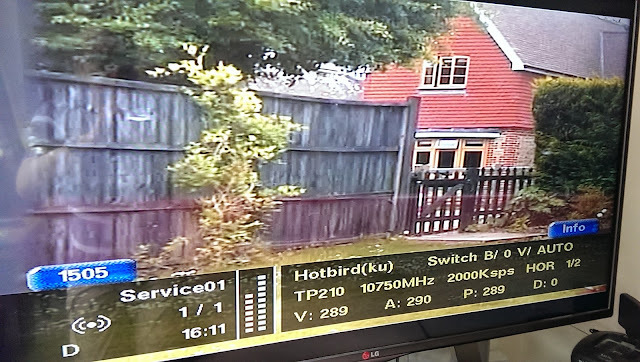 Recently I have been looking at the YouTube channel of Charlie Morris, ZL2CTM, who has built a software defined radio (SDR) using a Teensy microcontroller. Charlie doesn't give a whole lot of details about how to build this radio but I decided I wanted to try it out. 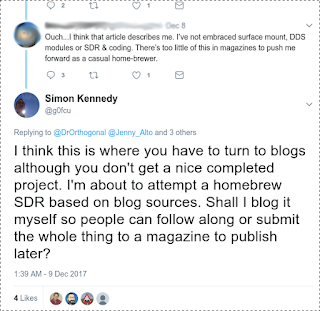 Edit: I have also been looking at VE3MKC's blog, I thought VE3MKC and ZL2CTM were the same person but it appears that they have been doing the same thing independently. My thanks to them both for the inspiration and for the information they have published. Given my experience with the VLF/LF receiver and the ST Microelectronics boards I used as well as the fact that I have three of these boards here I decided to build my version ZL2CTM's HF SDR receiver and transmitter that will be standalone, i.e. it will not require a PC to operate. 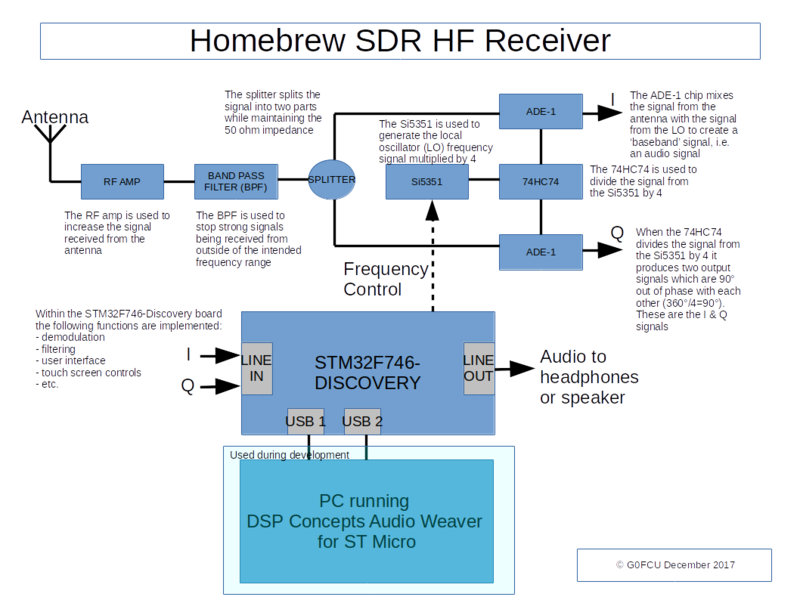 The block diagram below shows the main components of the transceiver although as most components are shared between transmitter and receiver I haven't bothered to put the transmit components in the diagram. When I come onto that area I will add them. I have included a description of the function of each block. Consequently, I couldn't really not blog about this project. I could say that all the individual parts of this project are simple enough but I frequently come across projects or circuits that leave out descriptions of a 'simple' part of the circuit because the experienced builder just cannot believe that not everybody knows what they know. Consequently, I will try to explain each section as I go along or provide a link to a resource on the Internet that does a much better job of describing it than I ever could. All components except the ADE-1 are through hole components and I will build Manhattan style. The ADE-1 can (just) be mounted in this way. After I complete this project I would like to try to build the same circuits using only SMD parts as a follow up. My choice of the STM32F746-Discovery board is mainly because I have one here. It costs about $55 and, although there does seem to be a bit of a lead time in the UK at the moment (December 2017), it is still in production and is fantastic value for money. It contains an ARM Cortex-M7 microprocessor, ADC's (analogue-digital controller), DAC's (digital-analogue controller), ethernet, micro-SD card interface, audio line-in/out and a 4.3" colour LCD-TFT screen with capacitive touch input among other features. You'd be hard pressed to find a 4.3" capacitive touch LCD alone for the same price on e-bay. 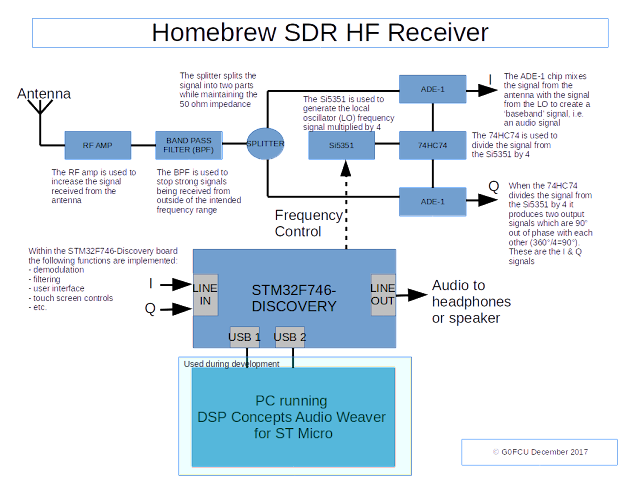 If I hadn't found that ST have recently licenced DSP Concepts Audio Weaver software for use royalty-free on ST devices this project wouldn't be going ahead but the Audio Weaver software is fantastic. It will enable me to design the software audio processing parts of the solution on a PC (sadly it doesn't work on Linux, even under Wine) and tune these in real time while they are deployed to the STM32F746 device. When the tuning is completed the code can be deployed standalone to the microcontroller. 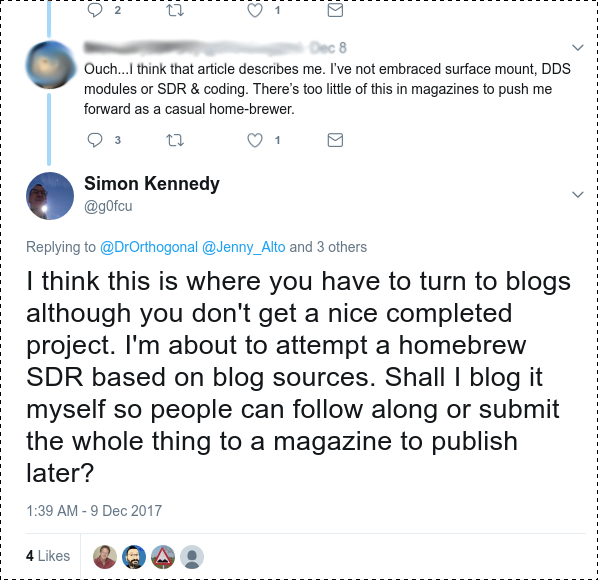 In fact, at the moment I think that the hardest part of this whole project is going to be building the graphical user interface, for which I will use STemWin, another piece of software that ST licence for their customers to use royalty-free. There will also be some resistors, capacitors and ferrite cores required that I will detail as I go along. If you already have an oscilloscope with FFT function then I suggest you build a wideband RF noise generator which will be useful to test the RF amp and bandpass filter. I built one like this because it uses the ubiquitous 2N3904 transistors but many designs are available on the web. Finally, a warning. This will be a learn as you go along project and if you follow along you need to be prepared to trouble shoot and fault find. As it stands at the moment I believe that it will be possible to build a transceiver as described above. What I do know is that we will all learn something and prove that not all of us are "Radio Amateuring like it's 1975"! Next post: The RF amp.